Ontarians are paying a premium of $164.9 million to replace Kingston’s mental health and rehab hospitals with a public private partnership. That’s nearly 38 per cent more than the public alternative. The figures come from Infrastructure Ontario’s own Value for Money (VFM) document recently posted on-line. The VFM notes the basic costs of the new hospital would have been $435.9 million had the province pursued the more traditional public procurement processes. Instead contracts were signed to build the same hospital for $600.8 million under a scheme that bundles 30-year financing and maintenance with the project’s design-and-build contract. When inflation and ongoing maintenance costs are applied to the contract, that amount rises to $901 million over the life of the agreement. Infrastructure Ontario justifies the higher price tag by arguing the P3 actually saves $152.5 million by transferring the risk of cost overruns to the private sector. They calculate that risk at a staggering 88 per cent of the cost of the publicly-procured model – or $383.6 million on the $435.9 million price tag. The amount calculated for risk appears to defy logic. The Auditor General of Ontario, when examining the deal to build the William Osler Health Centre in Brampton under an earlier P3 scheme, questioned the numbers behind a risk calculation that amounted to 13 per cent of the base government design-and-build estimate. At the time he pointed out the publicly procured Peterborough Regional Health Centre had been completed at just five per cent over the initial contract price. Peterborough had also been built over the same time frame as the William Osler Health Centre. “Owing to subjective nature of these estimates, it is virtually impossible to substantiate the validity and accuracy of the quantified amounts,” the Auditor General wrote of the Osler’s 13 per cent risk calculation. The Kingston VFM comes with a note from Deloitte that is similarly far from reassuring. Deloitte specifically notes it “did not audit or attempt to independently verify the accuracy or completeness of the information.” Instead Deloitte says that such calculations are in line with other VFMs done to justify such projects. The Auditor General also made the point that public or private, the same companies end up doing these kind of large-scale projects. Why would the same company be more efficient under a privatized financing model than a public one? The difference in cost of such projects is usually attributed to the rate governments pay in interest compared to the higher cost borne by the private consortiums. Matti Siemiatycki, an assistant professor at the University of Toronto’s geography department, noted in a 2013 paper that interest rate spreads between public and private financing are between 150 and 400 basis points – that’s no small change over a 30-year agreement. In the William Osler case that amounted to a difference of $200 million. P3s are also notorious for the high transaction costs behind such projects and ultimately, shareholders are looking for a stable rate of return on their investment. That all gets bundled into the higher project cost. Siemiatycki interviewed former Ontario Infrastructure Minister David Caplan for the same paper reflecting on 20-years of P3 practice. Caplan was remarkably frank about the government’s attempts to distance itself from the first round of public-private partnerships. Community upset, particularly around the Tory fire sale of Highway 401, meant a change in tactics. “We found there was no real public appetite for privatization and what we had to do was to change the lexicon – change the language and that is why we came up and looked for the most boring term that we could possibly find – what we called AFP, alternative finance and procurement,” Caplan told the University of Toronto researcher. Openly admitting that many of the concerns of the “ideological left” were in fact “legitimate,” Caplan told Siemiatycki that the government changed course and started undertaking P3s that would be more modest in scope to build up their credibility. After several years of shorter term P3s – where financing only took place during the construction phase – the Wynne government is clearly using Kingston to expand the scope of the P3 model according to Caplan’s strategy. Claiming that such projects are on time and on budget (largely by padding the costs significantly up front), the new Kingston hospital is already behind the timeline set out for it in 2012. Originally the project was to be under construction in October 2013. Instead the financial close didn’t happen until December, with construction beginning only last month. That’s seven months behind plan. 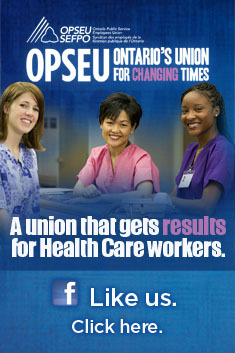 Tomorrow OPSEU President Warren (Smokey) Thomas will be in Kingston to talk about such privatization deals. Press are invited to meet him and other speakers at 11 am in Lake Ontario Park, adjacent to the Providence P3 project. At 11:40 am OPSEU members are invited to join Smokey for a P6 Picnic. P6 stands for: Private Partner Profits, Public Partner Pays. This entry was posted in Uncategorized and tagged David Caplan, Kingston P3 hospital, P3 procurement, Privatized infrastructure development, Providence Care Mental Health. Bookmark the permalink.